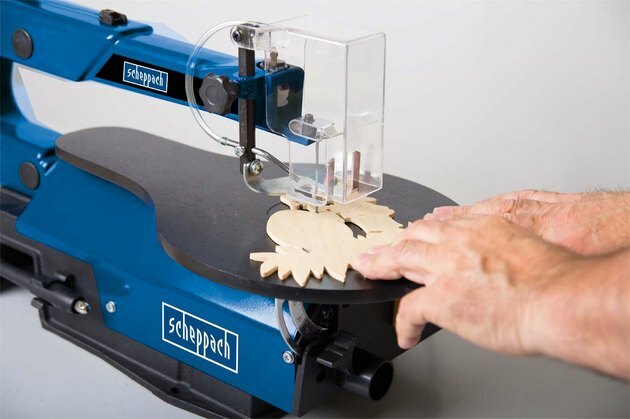 A scroll saw is the tool to use for cutting intricate shapes. Although it is a saw— which means it can certainly cut through your fingers if you're not careful—a scroll saw is one of the safest and most delicate power tools a woodworker can use. You need one if you're doing marquetry or any kind of inlay work, and the scroll saw is also a handy tool for cutting dovetails and doing other types of intricate joinery. It's also a great tool for home hobbyists who like to make wooden toys, nameplates or puzzles, and it's a must for musical instrument makers. Like its manual counterpart, the coping saw, a scroll saw is designed to cut decorative curves and corners. To do this, the blade has to be very thin, and thin blades break easily. That's the biggest drawback to using a scroll saw, but you can avoid breakage by setting up the saw correctly and using it the right way. It's also important to know what you can and can't do with a scroll saw. 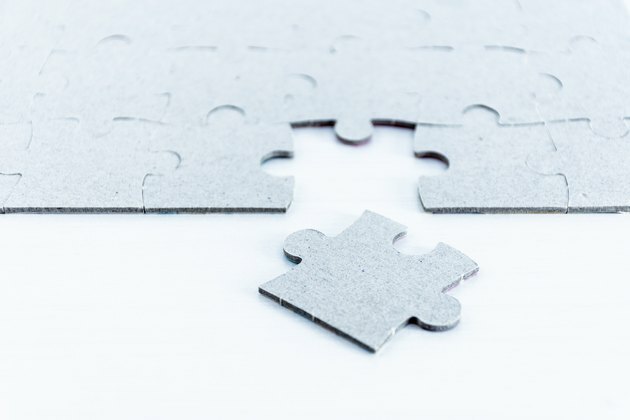 If you push this tool beyond its capabilities, you'll get subpar results and you may end up damaging it. Scroll saw designs vary, but they all have the same basic parts. If you could mount a coping saw on a reciprocating motor, you'd basically have a scroll saw. One of the original designs—and the one that many craftspeople consider still the best—suspends the blade between a pair of parallel arms. When the blade breaks, the top arm swings up and away from the work table and prevents the broken blade from doing any damage. A simpler design has the blade suspended between the ends of a C-shaped armature. When the blade breaks on one of these, it keeps moving until you shut off the motor. 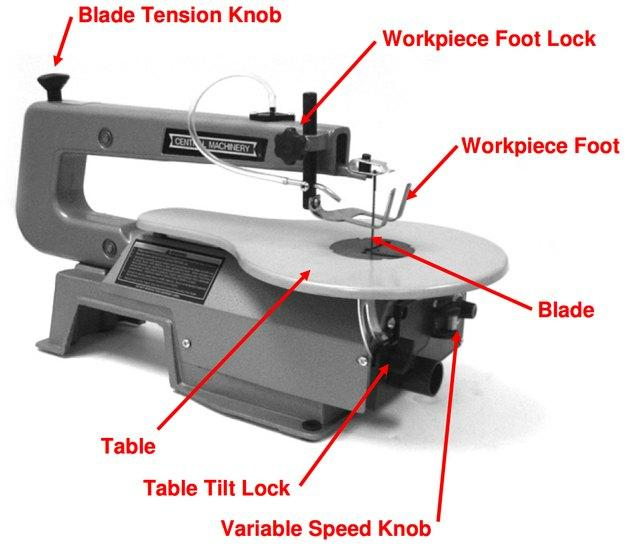 Besides the blade and the armature, most scroll saws have a tilting work table with an adjustment knob to set the angle. You'll see two other control knobs on most models:—one is for setting the speed of the blade and the other is for adjusting the blade tension. This second adjustment knob is a crucial one. You have to set the tension just right to get good cuts and avoid breaking blades. In addition, many scroll saws have an air blower to keep the work clean so you can see what you're doing. Choose the blade according to the thickness of the wood you're cutting. The size of the blade you should use, along with its tooth count and tooth style, depends on what you're doing. Blade widths are measured in units similar to wire gauge. The thinnest blades, with gauges such as #3/0, #2/0 and #1/0, are best for inlay work, while heavier blades, with gauges measured in numbers from #1 to #12 and above, are better for cutting thick wood, hardwood or stacks of thin wood. Unlike wire gauges, blades with higher gauge numbers are fatter and sturdier. That means they don't cut curves as accurately but aren't as likely to bow, either. For general purpose cutting, choose a #5 or #7 blade. Tooth count determines how fast the blade cuts and how much it burns as it cuts. Smaller tooth counts mean faster cutting with less burning but an increased likelihood of wood chipping and splintering. Tooth style is also important. A standard blade has regularly spaced teeth pointing in the down direction and is good for most purposes. A skip tooth blade is one with fewer teeth spaced farther apart, and a reverse skip tooth blade has teeth on the lower section pointing in the opposite direction to the rest. Choose a reverse skip tooth blade if you need a splinter-free cut on both sides of the wood. If you like to make puzzles, you need a scroll saw. A scroll saw is a lightweight tool intended for specialty work, and you won't find one in every woodworking shop. It excels at cutting thin wood for inlay work, shaping pieces to make interlocking puzzles and toys, and cutting the intricate pieces that go into the manufacture of guitars, violins and other wooden instruments. A cabinetmaker might use a scroll saw to cut dovetail joints, but more likely would use a bandsaw, reserving the scroll saw for shaping molding and cutting inlays. 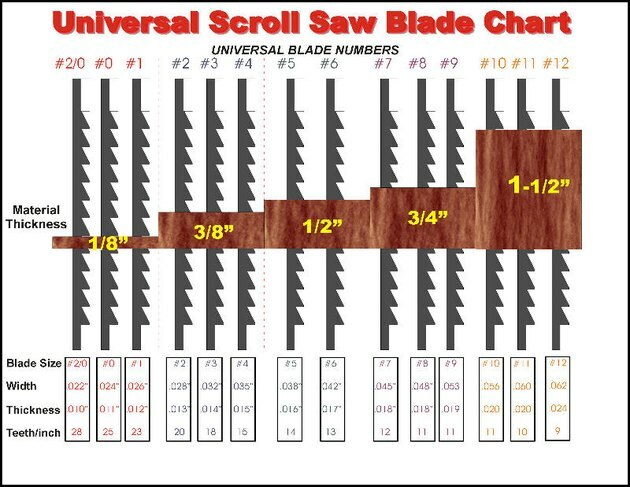 Using a heavy-duty #12 blade, you might be able to cut material as thick as 1 1/2 inches with a scroll saw, depending on the model, but most saws work best with material less than 3/4 inches thick. Notice that a scroll saw doesn't come with a fence. That's because it isn't a good tool to use for ripping or dimensioning wood. Use a bandsaw or table saw for that. 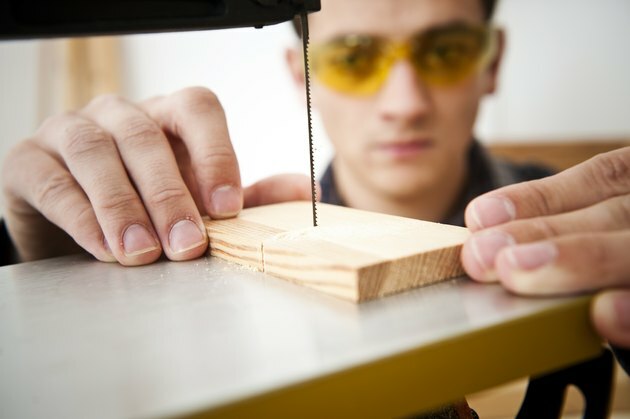 Although a scroll saw is a relatively safe tool, protective eyewear is still a good idea. All tools require a bit of practice, and a scroll saw is no exception. The blade is so thin that it bends easily, and that can ruin your work. You can avoid this by setting up the saw properly, holding your work with just the right amount of pressure and working slowly so the blade has time to cut. Tension the blade: When you insert a new blade, you clamp it to the upper and lower armature. Once it's secure, adjust the tension with the adjustment knob. Some pros claim that when the blade has the right amount of tension, you'll hear a middle C-note when you tap it. The point is that a properly tensioned blade is tight enough to vibrate like a musical instrument string. Just don't aim for octaves higher than middle C, or the blade will break. Hold work lightly: This may seem counterintuitive, but the piece of wood you're cutting should be held loosely enough to allow it to vibrate a little. Pressing down on the wood can actually pull the blade to one side or another and cause it to make an angled cut instead of a straight one. If you allow the wood to move slightly, though, the blade will pull it to the point of least resistance, which is when the blade is straight up and down. Don't hog the wood: "Hogging" is the woodworking term for pushing the wood too fast through the blade. When you do this with a scroll saw, the blade can bend and break, and it can also burn the wood. Push the wood slowly to give the blade time to do its job.